We have been working for some time to get water to the property where we are building our house. It is a bit uphill from the rest of campus, so we needed to build another water tower and install a booster pump. Since we needed to get the water up to the property anyway, we decided to provide a tap for our neighbors. They were all fetching water from a place that is about a 10 minute walk away. We were hoping to make this water available for our neighbors back in December, but we ran into some complications. Finally, this weekend we got the water flowing into the tank! We scheduled a meeting with our neighbors to talk about how it works and let them know that they are free to use it. As we met tonight, we told them that we are thankful to have them as neighbors and talked a bit about the water. David explained how it works and demonstrated how to use the tap. After that he told our neighbors the story about Jesus explaining that he has living water. 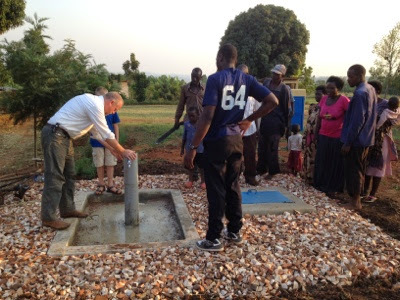 He told our neighbors that we hope they will quench their thirst with water from this tap, but we also hope that they will have living water through trusting in Jesus. Jonathan, our pastor from our local church, translated for us and closed our meeting with prayer. 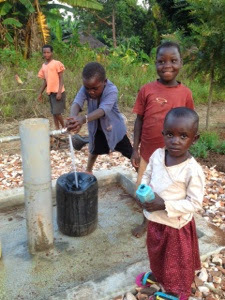 Afterward, the children began bringing their containers to get water for their families. They were all excited to not have so far to walk. We are so grateful for many of you who have helped make this project possible! 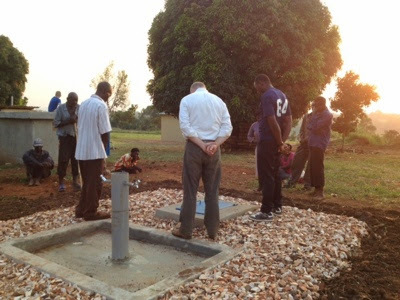 Please pray with us for our neighbors, that they would receive living water through trusting in Jesus.